embroidery module from The Inspired Sewist? Then this class is free to you. Prefer private lessons? No problem. Call us for pricing and details. 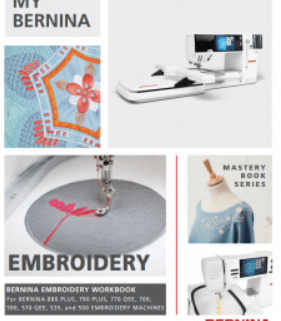 Description: Now that you own a wonderful BERNINA with embroidery capabilities let Nan take you through the workbook to teach you how to use it. Learn about hoops, stabilizers, needles and threads for your projects and how to get the best results to get you started. After learning the basics, you will be able to join us for all kinds of fun embroidery including Kimberbell Krew and embroidery events.